Old Forester is what it is, and that’s why it works. Old Forrester has about as much tradition as you can get in a Bourbon. It is a single brand of Bourbon that has been continuously available for 145 years — most of that time from the same family of craftsmen at the same distillery. Interestingly, it was the first Bourbon to be available exclusively in sealed glass bottles. There was a lot of nefarious re-bottling and dilution going on and this was a way to ensure quality and integrity. Today it is owned by Brown-Forman, available in eight different varieties and is a sister Bourbon to Woodford Reserve. If Old Forrester had a resume, it would be a full one — “Best Bourbon Under 10 YO,” “Double Gold Medal,” “Best Bourbon 2012,” “94 points,” and so on. It has garnered all of those accolades by being true to what it is. And what it is is a traditional Rye-forward Bourbon made in much the same way as it has been for generations and bottled at a respectable 43% ABV without any marketing flimflam or artificial ingredient trickery. It’s a real Straight Kentucky Bourbon made from day one for real people who like real cocktails. And you just got to love that, right? Smartass Corner: Woodford is the “Official Bourbon” and its sister brand Old Forrester is the part of the “Official Mint Julep Cocktail” during the famous Kentucky Derby horse race at Churchill Downs racetrack. What does Old Forester Bourbon taste like? The Flavor Spiral™ shows the most common flavors that you'll taste in Old Forester Bourbon and gives you a chance to have a taste of it before actually tasting it. Great whiskey. Wonderful quality for the price! Quickly becoming my go-to $20 bourbon. Spicier than Beam and the same price. Given the price, this was a great bourbon. Just the right amount of burn with a warm vanilla finish. 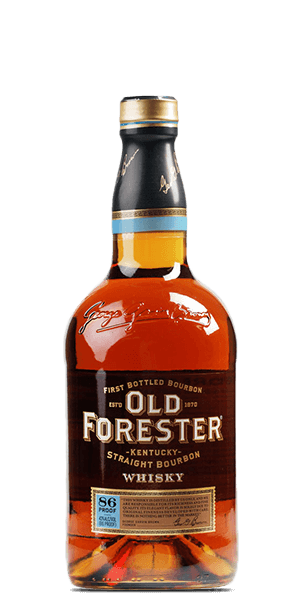 My go-to is Woodford Reserve, but Old Forester doesn’t disappoint as a less expensive memeber of the family. In Old Fashioneds or on rocks I’ll take this at almost 1/2 the cost of it’s more refined cousin. This is an excellent "budget friendly" whiskey with great taste. Easy to see why this stuff has been around for awhile. I really like this Whisky. It is much smoother than I expected to be and was pleasantly surprised. This may become my new go to Whisky. Hints of cinnamon spice is what came across to me. For what it is Old Forester is great. A classic that can't disappoint. This has become a good standby for me. I don't normally care for anything with a cherry flavor but this one is very good. Really good for the price!! A little to spicy for me, best with a mixer. Great tasting bourbon and a reasonable price. Very nice smooth bourbon. A great value at that price. Nice vanilla notes with a smooth after taste. One of my regular rotators for cheap bourbon. Amazingly good for the price, but a bit of a bitter aftertaste. harsh ethanol burn covered up the flavor. After heavily diluted I could drink it, but the body was gone. Tasty, smooth. I'd buy it again. By far the "best bang for the buck" in bourbon. While others went to 80 proof, OF remained true to its roots and remained at 86. A "real" American whisky. Forget the snobs, the single barrels and the very small batches--this is how bourbon should taste--smooth, with a gentle reminder that bourbon is the original American moonshine at the end--just like it should. I summarize the taste as being the epitome of Kentucky Bourbon. In my opinion, it's one of the best bourbons for the money. Best every day drinker I've tasted. Very smooth. Good value. My go-to for everyday bourbon. Light aroma and body. Notes of vanilla, caramel, apple, and brown sugar.